Image courtesy of Tantor Media, Inc.
To be totally honest, what I knew about World War I would fit into a very small teacup before I started listening to To End All Wars: A Story of Loyalty and Rebellion, 1914-1918. Usually I shy away from these types of war biographies, but what intrigued me about this book is that it is told through the eyes of the peacemakers in the war, from a very human, vulnerable point of view. Narrator Arthur Morey sets the right tone for this book: his voice is clear and soothing, but gives the kind of depth and solemness needed for such a serious topic. Rather than being told as a straight-out chronology of events, author Adam Hochschild engages the reader by focusing on the relationship between the people fighting the war and the people opposing it. One of the most interesting points the book makes is how World War I really set the stage for World War II; and how Germany's losses in World War I embittered a well-known soldier, Adolf Hitler. The book picks apart several major historical figures, delving into their psyches as only an author who has done an exhausting amount of research can. Field Marshal Douglas Haig, who was the British senior officer, became so obsessed with the idea of Britain claiming a victory that his ambitions led to the deaths of thousands of soldiers, particularly during The Battle of Somme in France. The opening day of the battle saw nearly 60,000 casualties on the British side. The book also talks about the women who were very influential during the war, such as Maria Bochkareva, a 25-year-old Russian woman who was given special permission by the goverment to enlist in the Army. She then organized the "Women's Battalion of Death", whose members "shaved their heads, slept on Bar boards during training, endured the same corporal punishment as male Russian soldiers, and sported a skull-and-crossbones insignia." Boy, would they have made a great Roller Derby team or what? The book also talks about the Pankhursts, a family of powerful women who promoted their ideas through newspapers and public gatherings. However, two of the sisters would find that their differing beliefs about the war would divide them straight down the middle. The book also talks of the writer Rudyard Kipling, his involvement with the war effort, and the crushing blow that the death of his young son John in the war dealt him. For John had bad eyesight and the Army would not take him, but his father, ever supportive, managed to get him in anyway through his political connections. His son's body would never be found. 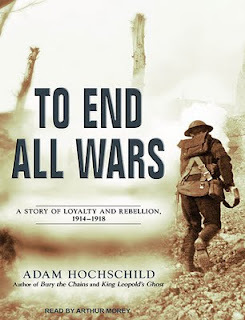 Hochschild reminds us that the impact of the war remains prevalent today...."some half-million pounds of First World War scrap is still collected from French and Belgian fields each year. And everywhere along the old Western Front the soil continues to yield up bones: the remains of 250 British and Australian soldiers were found beneath a French field in 2009." Sobering, but vital, it is a book with much heart, as well as being a great, easily understood overview of the war, its immensity, and its impact. Morey's gentle voice and incredible research on the pronunciations of names and places gives the story its due honor as well as making it a great listening experience. Click here to listen a sample.